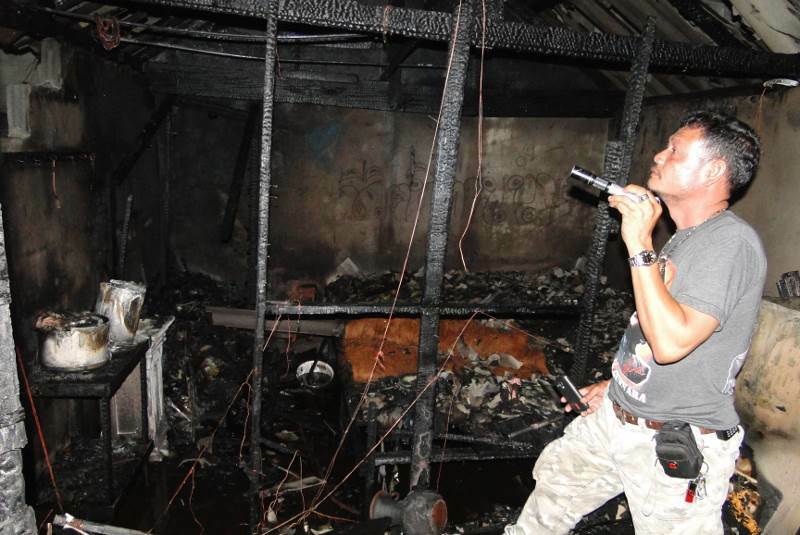 PHUKET: The 2013 Vegetarian Festival may have claimed its first casualty – a house near Wat Baan Don, Cherng Talay, badly damaged by fire last night (October 3). The owner of the home, Rungtiwa Nuansri, 29, believes the blaze, which she says caused damage totalling B30,000, was caused by youngsters throwing fire crackers around. Ms Rungtiwa watched in dismay as firemen took an hour to put the flames out. No one was in the house at the time; Ms Rungtiwa and her family had moved in with relatives temporarily after the power to her house was cut off three days earlier because of an unpaid bill. Because of this, she said, she was certain that a short circuit was not to blame for the conflagration.